Laveranues Coles | Wassup Sports!?!?!?!? Personally, I am an Eagles fan. Unfortunately, I do remember sweeping the New York Giants three straight times last season, so I know it can be done. So far, the Cowboys secondary has shut down DeSean Jackson, and if he can’t make any plays, they are done for. 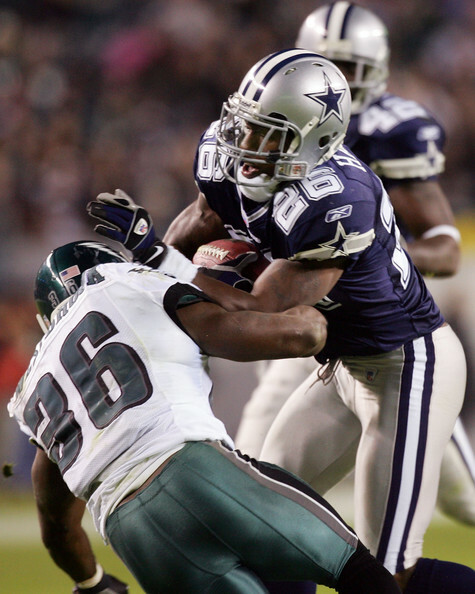 Although, McNabb must step up his play to get Jackson the ball, for he looked absolutely lost last Sunday. I don’t see anyway my birds can pull this one out, as the Dallas defense is just on a roll, and they showed no way of stopping either the Romo-Austin or Romo-Witten connections last week. I see this game as a bit of an easy matchup as well. Green Bay blew apart the Cardinals last week, and there is no reason to believe that they won’t do it again. The Cardinals are most likely going to be without WR Anquan Boldin, who can barely walk now with his MCL sprain and an upper ankle sprain. Yes, the man is tough, but even if he does play it would be a very small contribution. Without Boldin, the Packers can put the NFL’s best cornerback, Charles Woodson, up against WR Larry Fitzgerald all day, and blitz Warner nearly every play. This could be the best game of this weekend, as the Patriots prolific offense will matchup against the always ready Baltimore defense. However, the Patriots are missing the NFL’s leader in receptions, Wes Welker, and will be relying on rookie Julian Edelmen to replace him. Frankly, the x-factor in this game is Ravens’ QB Joe Flacco. He has had a pretty inconsistent season, but if he can play a good four quarters, with passes setting up the running game with RB Ray Rice, than the Ravens should come out on top. Yes, the Jets held Carson Palmer to zero yards on eleven passing plays. Yes, Chad Ochocinco injured his knee in pregame warm ups and was a non factor. 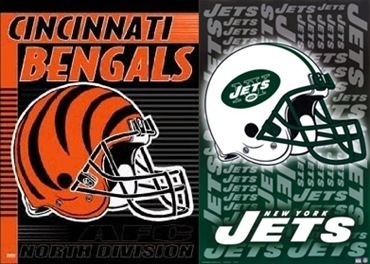 Yes, the Jets walloped the Bengals 37-0. However, the playoffs are a different animal. Rookie QB Mark Sánchez will have to learn that mistakes are more critical now than in the regular season, and have to be held to a minimum. Also, the Jets must realize that just because their coach, Rex Ryan, calls them the favorites, doesn’t actually make them the favorites. The Bengals had absolutely nothing to play for last week. That’s why I expect a totally different team to take the field, and beat the New York Jets. I believe this was the toughest call on Wild Card weekend, as I had felt that the Jets were going to win earlier in the week. However, as we creep closer and closer to game time, something inside of me is telling that the Bengals will run through the Jets top defense, setting up the passing attack to WR Chad Ochocinco and former Jets’ wideout, Laveranues Coles. Overview: The Bengals leading passer in ’08 was Ryan Fitzpatrick, who is no longer with the team. Their leading rusher was Cedric Benson, after being released by the Bears and serving a four game suspension. Cincinnati’s leading receiver was T.J. Houshmandzadeh, who is also no longer with the team. The lack of consistency on defense, and the poor production on offense led the Bengals to a 4-11-1 record last season. Offseason Moves: The Bengals started off by letting WR T.J. Houshmandzadeh go to Seattle in free agency, along with T Stacy Andrews, and replaced him with lesser WR Laveranues Coles. Cincinnati also added backup RB Brian Leonard, and longtime Cowboys S Roy Williams through free agency. In the draft, the Bengals took Alabama T Andre Smith in the first round, USC LB Rey Maualuga in the second round, and Georgia Tech DE Michael Johnson in the third. Upcoming Season:The offense of the Bengals solely relies on QB Carson Palmer’s health. If Palmer is healthy, he can spread the ball around between WR Chad Ochocinco (oh wow) and Laveranues Coles. I’m not sold on their running game with Cedric Benson, and their offensive line is rebuilding. The defense appears to be on its way up, and look for it to take one or two games for the Bengals this year. Player to watch: Of course it’s QB Carson Palmer. Without him, WR Chad Ochocinco had his worst season since his rookie year of 2001. Ochocinco consistently had 1000 yards, and if Palmer is healthy, look for that to continue, and for the Bengals offense to have some big play ability. The Bengals are another team that just haven’t taken big enough steps to improve, or even get better. Losing WR T.J. Houshmandzadeh really hurt, and you can’t replace a player like him. The most interesting thing about this team will continue to be Ochocinco’s TD dances.